The guys started out their hunt in Spring Hope,N.C. @ 6:15 a.m. where they had been scouting the week before.They set up an Ameristep ground blind and at first light began to call.After only a few yelps they heard a gobbler in the distance.They continued to call at 15-20 minute intervals and at about 8:00 a.m. two hens responded and that brought the gobbler and the hens their way.The two hens crossed in front of the blind bringing the gobbler with them.A few more yelps from the slate call and Landon was on bead with his Rossi .410 with #5 shot.Landon pulled the trigger and...Boom!...he turned to his PaPa and said...'He's a goner PaPa!! '.Landon is 5 years old. 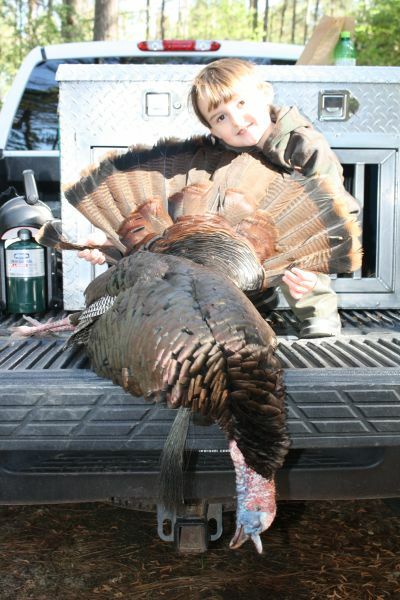 This was his second youth day turkey hunt and this was his first kill.